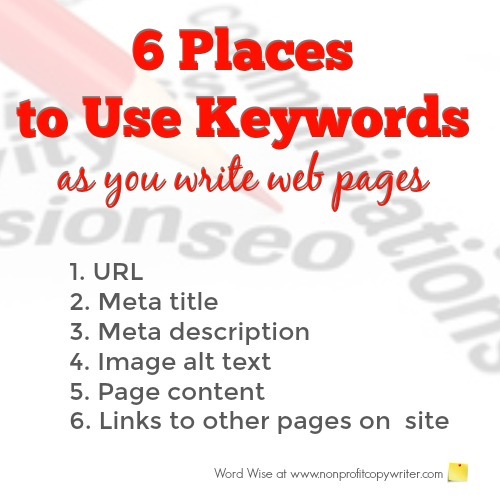 When you know how to use keywords, you can write better web pages, blogs, and social media posts. But how do you know which keywords to use? You can use a free tool like Google Keyword Planner to find relevant keywords for your topic. These tools return data that show you how many pages already use that term (supply) and how many users are searching for those terms (demand) – in other words, what kind of competition your page may have in search results. Thoughtful keyword research will give you a list of keywords to use which you can divide into two kinds. Broad keywords: generalized one word terms or short phrases that can apply to others both in your niche and outside of it, but are good choices for your website concept and its foundation content. Long-tail keywords: two- to five-word phrases (hence the “long tail”) that are very topic-specific. These are your heavy lifters as you write individual pages or posts. As you write your content and load your page or post, use keywords in these on-page components. URL: the web address of the page. For example, this page’s URL is www.nonprofitcopywriter.com/use-keywords. Meta title tag: text that appears as the page title in the web browser. You add the title tag in the back end or header of your site (depending on your website platform) as you write the page. The best titles are 50-60 words. Longer than that will be cut off by the browser. Shorter may not be descriptive enough to differentiate from other pages. Meta description: a summary of the page’s content, added in the back end or header of your site. The meta description is the snippet of content that appears below a page link in your search results. Keep it to 160 characters or less, if possible, because search engines like brevity. Image alt text: Include your keyword so that search engines can understand what the image shows and to give readers an explanation when images cannot be found. Page content: Of these, the most important is page content. Use your page’s main keyword in the first 90 characters of the page and then sprinkled throughout the page. A word of warning: don’t use your page or post’s principal keyword in excess … the search engines penalize for what they call “keyword stuffing.” About once per every 150-300 words should do it nicely. Links to and from other pages on your site. You’ll give readers the opportunity to get more information on another page, plus you’ll repeat your keyword(s) and boost your site’s ranking. Powered by SBI! Learn more here. Grab your exclusive FREE guide, "5 Simple Writing Tips You Can Put to Use in 10 Minutes or Less"
Get more writing tips like these each week in your inbox for free. Learn more. All rights reserved. No reproduction without permission.